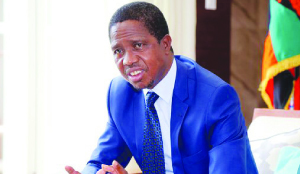 I WRITE to commend and praise President Lungu for instructing the ministers and party functionaries to immediately stop commenting on the arrest of the opposition leader Mr Hakaindi Hichilema. He also instructed the ministers and party functionaries not to engage foreign diplomats without clearance from State House. It is my hope and prayer that those affected by this instruction will take it in good spirit and wisdom in which it has been issued. Let the President be assisted in governing the country in an orderly manner. Certain issues in governance, especially those involving diplomats, require careful and proper handling. Some of the comments and statements that have been made by some ministers and party functionaries have put the President in an awkward situation or position. There are many of us who cannot distinguish between an official Government position and personal opinion of an individual functionary. And the Nation should give the Catholic Bishops initiative aimed at easing tension in the country a chance. There has to be some starting point, as talking of bias or what will not contribute anything towards normalising the situation. Nowadays, people are talking very carelessly about tribalism. They do not know that tribal remarks and ethnic degradation can land this country into very serious problems.